Is it a phone? Is it a tablet? No! It's a phablet! If there's one thing that annoys me it's the obsessive miniaturization of electronic products. Although I don't have anything like RSI or arthritis or poor motor skills, with most teeny digital devices my fingers become inaccurate banana-like appendages stabbing at the minuscule keys with a success rate of maybe 50% at best. Even the iPhone is on the edge of usability. If I want good accuracy when using the iPhone's on-screen keyboard I have to rotate the phone into landscape mode so I get bigger virtual keys to stab at. And don't get me started on the iPhone screen! Sure, it's got great resolution if you're 20 years old and have 20/20 eyesight. For the rest of us it's "where did I put my glasses?" (which is always a problem because finding your glasses when you're not wearing them can be, shall we say, challenging). Why, oh why, does everything have to be so tiny? Well, despite coming from the land of obsessive miniaturization, the product designers at Samsung figured out that not everyone wants tiny, so they produced the Galaxy Note. The Samsung Galaxy Note is a hybrid that is half phone, half miniature tablet, a combination described by some publications as a "phablet" (one of the most horrible portmanteau words ever coined). Let's compare the Samsung Note to the iPhone: The iPhone 4S is 4.5 inches tall by 2.31 inches wide by 0.37 inches thick, weighs 4.9 ounces, and has a 3.5-inch diagonal screen with 960-by-640-pixel resolution at 326 ppi. The Note is 5.78 inches tall by 3.26 inches wide by 0.38 thick, weighs 6.3 ounces, and has a 5.29-inch diagonal Super AMOLED screen with 800-by-1280-pixel resolution at 285 ppi. While the iPhone's screen is, indeed, fabulous, so is the Note's, despite its lower pixel density (I love those AMOLED displays ... the colors are great). Other than those attributes, the main differences are in the operating system (the Note runs Android "Ice Cream Sandwich"), Note's inclusion of the excellent Swype keyboard, and the Note's focus on pen input. The Note has a bay on the bottom that stores the included stylus which Samsung is pleased to call the "S Pen." This stylus includes a shift button to invoke various functions depending on the software it is used with. While the pen input is good for navigation and kind of useful for taking notes, writing on the Note still feels wrong. There's not the right amount of drag on the pen tip so it feels like writing on glass rather than paper. Will anyone ever get this right? The Note comes with an optional free collection of apps in a sort of mini embedded app store from Samsung that requires agreeing to a separate license and establishing a separate account with Samsung. Given that the device runs Google's operating system, how hard would it have been to use Google's OAuth rather than a completely separate login? Overall I like this product. The performance is great, the display is great, and its nice to have a device I can see without glasses. On the other hand, as a phone it feels odd. It's a little uncomfortable and, if you have small hands, it will probably be too big. For some people this phone will be just what they're looking for, while, for others, its size will probably make it a little too weird to be comfortable. 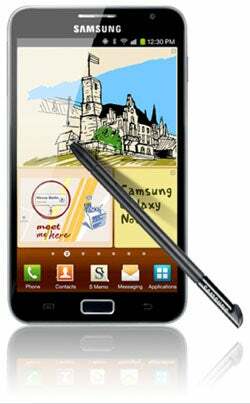 Priced at $250 with a two-year contract, or $749 without a contract, the Samsung Galaxy Note gets a Gearhead rating of 4 out of 5. Obviously when it comes to price, there's not enough focus on miniaturization. Gibbs is vision challenged in Ventura, Calif. Tell him at gearhead@gibbs.com what you see and follow him on Twitter (@quistuipater) and on Facebook (quistuipater).